I love jams and jellies and preserves. The time honored breakfast staples don't me feel so guilty about indulging in sugary treats when I should be filling up on oatmeal (shudder!) and such. 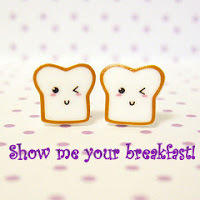 A slice of milk toast, drizzled with some salty melted butter and a smear of jam is a perfect beginning to my day. So imagine my delight when I found a preserves mini sampler at a Harry and David outlet. I haven't heard much about Harry and David's except that they have good fruit, and didn't get a chance to try their products earlier. Well, good fruits make good preserves and I was completely sold on the mini bottles that promise me a different jam every week! And then they are sugar free too. So far I've only cracked open the Oregold Peach, which was a generic Peach jam, nothing special. I'm more excited about the Dark Cherry and Red Raspberry. There is also a Marionberry preserve which I'm planning to use with crepes. I do hope they will be better than the Peach. Its been a long time since I updated the blog or taken part in any blog events and Divya's breakfast event seems like the perfect opportunity to jump back in. Disclaimer: The views expressed in this blog are those of the author and do not reflect healthy eating habits, exhibit A: a post on chips, B: breakfast ideas more suitable for 5 yr olds etc. I've never tried Harry and David jams but I've had some D'anjou pears and they were freakin' awesome, the juiciest ever! Vipins, you been busy. Your blog looks too good! Jessica, I have heard good things about their Bing Cherries too. Gotta try.